Chris Pappas participates in a debate of Democratic hopefuls in New Hampshire's 1st Congressional District at St. Anselm College in Manchester, N.H., earlier this month. Pappas won the Tuesday, Sept. 11, Democratic primary and will represent his party in the November general election. Pappas was backed by virtually all of the state's political establishment, including Democratic Sens. Jeanne Shaheen, Maggie Hassan and neighboring Rep. Annie Kuster. His chief challenger was Maura Sullivan, a former Obama administration official and Marine veteran who had just recently moved to New Hampshire and had to shake off the carpetbagger label. Sullivan positioned herself as more of an outsider, a contrast to Pappas, who had worked his way through the state's political hierarchy and had been courted as a federal candidate for years. Sullivan had the backing of EMILY's List and VoteVets, a liberal veterans organization, and had raised the most money in the race — nearly $2 million — but the bulk of it was from out of state. Several candidates angled for the progressive mantle, essentially splitting the vote. One of the progressive movement's heroes, Vermont Sen. Bernie Sanders, who easily won the state's 2016 Democratic presidential primary, had a personal connection to the race — his son, Levi Sanders, also ran. But the younger Sanders never caught fire and his father didn't campaign on his behalf. 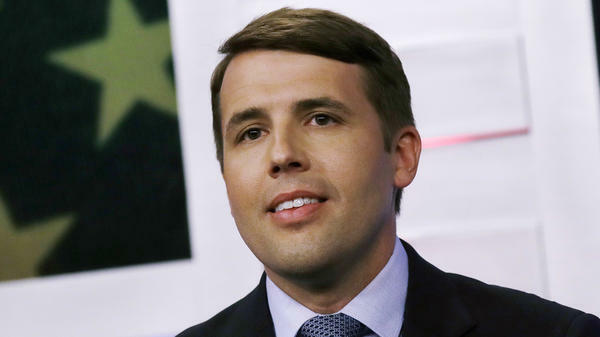 Pappas's victory positions him to become the first openly gay member of Congress from New Hampshire. He's now the 23rd LGBTQ congressional candidate who will be on the ballot this fall, part of a surge in Democratic candidates who hope to usher in a "rainbow wave" come November. The 1st District is one of just 13 in the country currently held by Democrats that also voted for President Trump in 2016, though the district only voted for Trump by less than 2 points. Still, Pappas will be heavily favored given the current climate, and the Cook Political Report rates the district Likely Democratic. He will face Republican former local police chief Eddie Edwards, who would make history as the first African-American elected to Congress from the state if he wins. In the Democratic primary for governor, former state Sen. Molly Kelly defeated former Portsmouth Mayor Steve Marchand. Like Pappas, Kelly also had the backing of Shaheen, Hassan and many local and state leaders. Meanwhile, Marchand had campaigned as the more progressive candidate. But both he and other more progressive candidates in the 1st District were unable to replicate some of the come-from-behind progressive victories in other states, like Alexandria Ocasio-Cortez in New York or Ayanna Pressley in neighboring Massachusetts. Kelly starts as an underdog against incumbent Republican Gov. Chris Sununu, who has high approval ratings in the state. He was elected in 2016 (New Hampshire is one of only two states left that elects governors every two years), becoming the swing state's first Republican governor in more than a decade.